"It's late in the evening and you're hungry. You have peanut butter, apples and tortillas--you're saved! This would probably would work well with bananas as well." Spread half of the peanut butter on one side of each tortilla, spreading from the center to within an inch of the edge. Distribute apple slices evenly on one tortilla to cover the peanut butter. Sandwich together the two tortillas. Grill on a lightly oiled griddle or skillet over medium heat, 4 to 6 minutes per side. My kids love these. This also works with chunky peanut butter and any other sliced fruit you want to use. GREAT hands-on recipe for kids. Excellent!!! 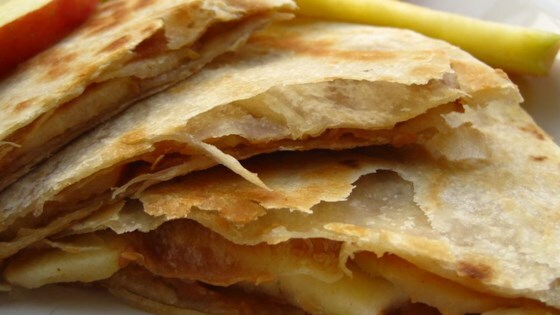 My boys loved these quesadillas. Instead of cuting the apples I just shredded it. Thanks for the recipe! I loved these! I buttered the ouside of the tortilla so it'd get crisp and golden. I didn't measure but used about 1/2 the amount of peanut butter and apple. I like to make these with peanut butter and Duncan Hines fudge frosting.